We met up with some old friends, pulled open the doors (complete with gas pump handles), and walked inside to the glory that was “old world” auto. My son’s eyes lit up at almost every turn while my wife and I enjoyed watching Man vs. Food’s Adam Richman take The Lube’s Atomic Wing Challenge which they had on loop during our stay. We’ve seen this plenty of times before, but it never gets old. The challenge is simple: eat six of their Atomic Wings without any beverage and your name goes on the “Wall of Flame” as well as a fancy bumper sticker. Now I am not one for hot challenges because I tend to like tasting my food, but I definitely won’t pass up the opportunity to try the sauce. So, I decided to order the Single (10 count) serving coated in Medium sauce with Hot and Triple Atomic on the side. The food came out and I was EXTREMELY disappointed at the size of the wings. I mean these things looked like they came from a chicken the size of a softball. I was just about to record them as a “1” on my wing scale when I noticed my buddy Mike’s wings. Across the table he held up a size “4” and the rest of his plate was roughly all the same size. I immediately got the waitress involved as I was curious why I had gotten the runt of the litter, or as I jokingly called it the “kids meal” version. She agreed and was quick on her feet to make it right by offering another five from the kitchen seeing how this current meal was not going to fill me. When the additional wings came out, they were a lot larger, and it goes to show that there is a major inconsistency problem with the overall size of The Lube’s wings. The sauces that they offer were extensive, and like Buffalo Wild Wings, are the main reason people come from all around to get a taste. I put aside my issue with the inconsistent size and dove into the batch hoping the sauce would compensate. I started with the Medium, and it had some really great flavor, but it really lacked in the heat department. I didn’t even get a “bite” of heat like the menu suggests unless you compare it to the Mild which tasted like a bell pepper bathing in butter. The Hot sauce brought the heat that I was looking for, but the flavor was overtaken by a harsh vinegar taste. This acidity needed to be balanced somehow, otherwise I’d only be able to eat a few because of the toll it took on my tongue. Mixing it with the Medium seemed to do the trick, as it still kept the heat that I craved but also stole a bit of the good flavor that the Medium held onto. After finishing all but one wing out of my dish, there was only one thing left to try… the Triple Atomic sauce. I’ve been watching over and over the loop of Adam Richman’s face as he sweats up a storm on the Atomic Wing Challenge, and I have to say it made me a little nervous. His was just the Atomic which was 150,000 SHU while mine, the Triple Atomic, was 500,000 SHU. But with my family, friends, and 32oz big f-ing mug of beer on my side, I was ready to give it a go. I dumped the sauce all over the last wing and gave it a huge bite. My initial reaction was that this was extremely hot, but not as crazy hot as I was led to believe. As time passed, the sauce intensified causing me to sweat and tear up, but ultimately, and rather quickly, started to die down. The flavors were great, and if they used any of those nasty tasting extracts, they covered it up quite nicely. The heat was intense and though it may leave some people begging for mercy, it was nothing like my experience with The Chicken or the Egg’s Ludicrous sauce. 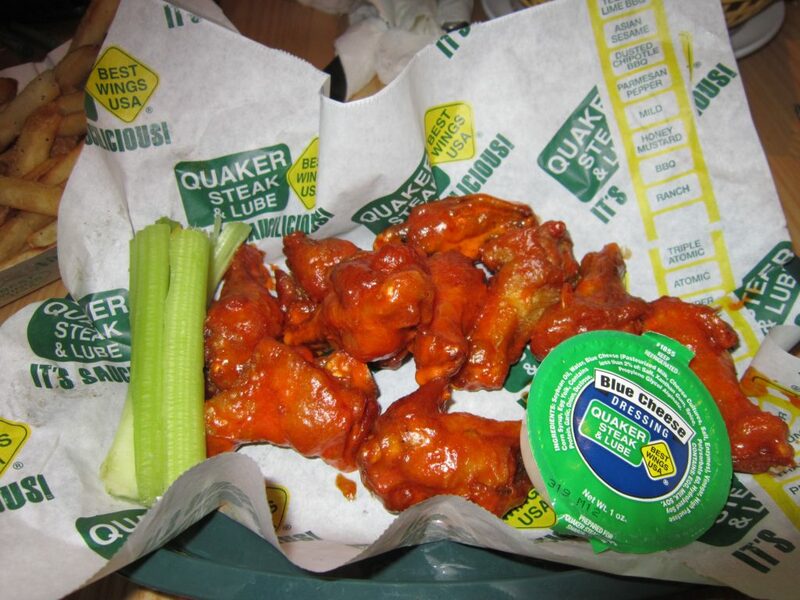 I had mixed experiences with my dinner at Quaker Steak & Lube that evening. The atmosphere and the staff, including management, were outstanding. But when it comes down to it, I came for the wings. The wings that grew popularity from Man vs. Food, the wings that were known to win all these awards, the wings that were “Best Wings USA.” And it saddens me that I didn’t get that. I’m sure that I will return one day, and when I do I will make it a point to update this review, but until then… If you are looking for a fun place with great staff and better-than-average wings, Quaker Steak & Lube is your place. But if you’re looking to eat some of the USA’s best wings, I recommend you look further.